The Hang Seng is at long term resistance, attempting to break out. By my secular/solar history analysis, the kind of path shown by the arrow would be appropriate, i.e. a breakout here, a rally away from the range, then a pullback in keeping with a final bear and mild recession before a new secular bull takes off with momentum. The German stock index and US SP500 stock index share a similar look to each other: battling to hold the breakouts made above the March 2012 highs. My leaning is that they are making bull flags above the breakout, successfully backtesting before advancing. This consolidation of several weeks post QE announcement fits the action post QE2 announcement before advancing, and it also fits with Presidential seasonality, namely a consolidation mid-October before a rally around the US elections. Gold has paused at horizontal 1800 resistance, and has made a 23 fib retrace. It could potentially drop further to make a 38 fib retrace, but either way I believe gold will shortly resume its uptrend and break through 1800, targetting the next resistance at 1900. Supporting that, seasonality is most positive for gold Sept-Feb, gold has been building energy in an 11 month consolidation, and if pro-risk breaks out as I predict above, I expect precious metals to also. The Euro-USD pair is at an important juncture. Either it is completing a bull flag in an ongoing uptrend and is about to break out above horizontal and down-sloping resistance, or its rally is going to end here at those key resistances and it will eventually break down beneath rising support. I favour the former, in line with pro-risk. A broad agricultural commodities ETF is shown below. After the fierce rally of mid-2012, brought about by extreme global weather conditions, softs have pulled back to between a 38 and 50 fib retrace currently. This is in line with Gann predictions for a partial retrace before a renewed rally to new highs emerges as of now, so perhaps once at the 50 fib, I expect softs to renew their upward trend. Supporting a rewewed advance in softs, the latest NOAA climate data for September came in as the hottest globally land/ocean for that month on record, and the latest US Department of Agriculture report revealed even tighter grains supply than previously understood. Supporting a wider rally in pro-risk from here we have (i) US economic surprises still trending up, (ii) US ECRI leading indicators still trending up, (iii) US retail sales and consumer sentiment surprising to the upside, (iv) money supply and export data from China surprising to the upside, (v) money market spreads in Europe and the US back to benign levels, (vi) German investor sentiment rising more than expected. In short there is growing evidence of global reflation, and there is a useful chunk of data coming out this week that will either add to or subtract from that, namely, Conference Board LI data for several key countries, some key China data including GDP, and some big US earnings reports. I believe pro-risk assets are primed to resume advancing technically, subject to supportive reflation evidence, and that recent data is supportive for reflation. I therefore maintain my pro-risk portfolio as it is. I have updated all models this morning. the chart forecast for the Hang Seng would be consistent with the ASX rebound. With the rally to capture the 2009 highs, a subsequent pull back, before really taking off in 2H2013 to hit pre-GFC highs. This runs in parrell with bond markets in Austraila suggesting the monetary easing cycle will continue intio mid 2013 with another 0.75% to cut off the benchmark rate. 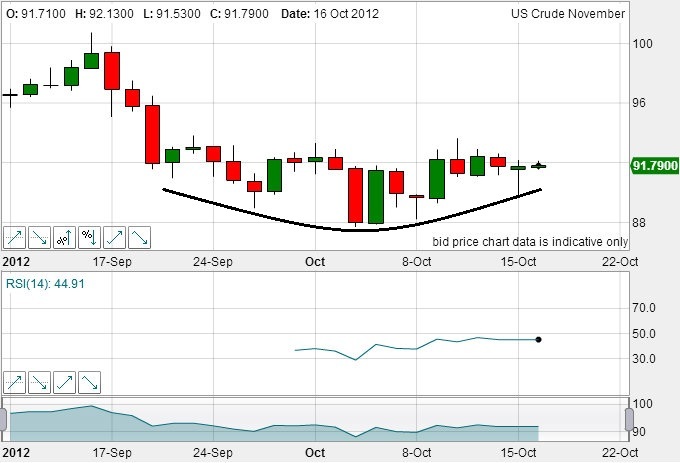 At the point that point would mark a yielf curve reversal as the commencement of a fast rally into 2H2013. I’m puzzled by coffee and sugar, both defying their seasonally strong month of October. Any thoughts? A sugar glut and lower coffee demand in the global economic ebb of this mid-year. I’ve always traded broad agri commodities exposure due to the lottery influence of the weather on individual softs. If you subscribe to a global reflation and a speculative commodities finale, then a degree of rising tide lifting all boats should pull up the laggards (particularly due to interrelations – planting switching and so on). So I’m still on the look out for any particularly oversold/overbearish contracts. Just to clarify the Hang Seng chart, you think the index won’t decline below 20,000 again? If that is true, I better load up the truck and buy as much Hang Seng as I can so I can become a rich man! The Hang Seng is trading at a p/e of 10.7, and a retreat to circa 20k in a year to 18 months time would take it into single digits under an inflationary 2013 as again forecast by solar/secular history. The momentum ‘go’ point, at which to load up the truck, would be 1-2 years away as shown on the charts I linked, when nominal price levels have fallen back to the kind of breakout level. But first, let’s see the breakout. I presume you expect failure. What would you imagine the FTSE 100 might do in the next year or two? It’s been the inbetweener of the western markets. The US ones are quite buoyant, hitting post-financial crisis highs, whilst some EU stock markets have penetrated the 2009 lows. My guess is that it won’t go lower than 5000 points ever again, and will start hitting the 1999 high by around late 2015, but that is based on no more major flareups of the euro situation between then and now. Mainly basing my assumption on the idea that the double dip in the UK has ended in 2012 and that a strong recovery is in place by 2014, helping with the deficit cutting. 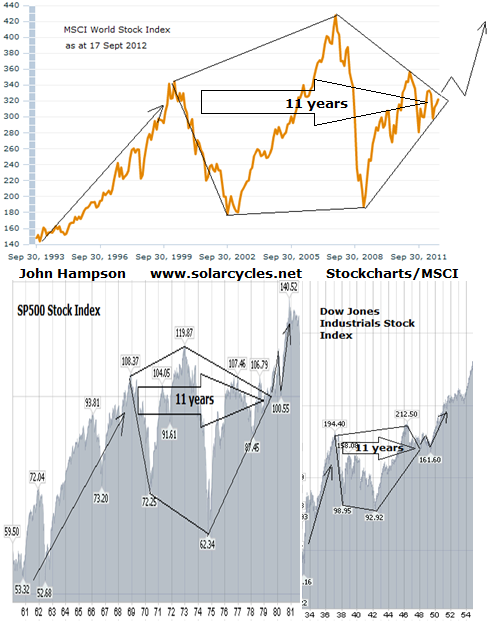 It’s not so dissimilar on the long term view – a secular bear pentagon and now up against down sloping resistance joining the 2007,2011 and 2012 highs. So I expect the same – breakout and up and then eventually give up those gains and then from there make that momentum ‘go’ point. Thanks John. These seem like very plausible scenarios, based on the previous cycles you have identified. Thanks Rob. I’ve steered clear of buying physical gold because I don’t want to get left with it, because of its lack of use or yield. I concur its about perception, so when the bubble bursts it’s going to be a big scramble out. But first a mania potential, and what that article suggests about the lack of natural correction mechanism if the gold price escalates makes sense. As I’ve said before, I’m invested for a mania, but don’t intend to stay until the end. Good ariticle. One geek note: The author erroneously interprets the contango in gold and the backwardation in the silver futures’ markets. These configurations have nothing to do with a markets expectations about future prices and everything to do with cost of carry and current supply in the spot market. Contango (higher prices in future months) is the normal state while backwardation (high near term prices) is not normal and indicates supply tightness for the physical commodity.